We are a professional restoration company that specializes in services ranging from performing routine cleaning and sealing of natural stone, concrete and grout to complete restoration projects including grinding, honing and polishing. We have decades of experience and technical knowledge to identify and solve even the most complicated stone, grout and concrete issues. 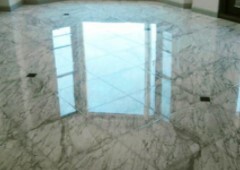 Whether it is routine marble polishing, scratch removal or extensive stone restoration, we utilize the most efficient and effective procedures to obtain the best results. We are stone craftsman and we know stone! Stone Countertops need to be periodically cleaned and sealed to help prevent staining. To thoroughly clean and disinfect your stone countertops, we utilize a cleaning system that combines a stone specific detergent and an anti-bacterial product to ensure your tops are clean and safe. We correctly seal your top to help prevent staining for years. If your Granite countertops are less than 5 years old, we have a sealer that is guaranteed (by an outside company) to prevent staining for 15 years. If you get a stain, that we cannot remove, the company will replace your slab. We are the only company in WNY that is authorized to perform and offer this guarantee. We also repair chips and recaulk backsplashes and sinks. We have been solving mold, mildew, and bad grout issues in showers for over a decade. Our years of installing showers enables us to identify whether your issue is topical or more severe in nature. Because we know both the installation and restoration of showers, We have saved our customers thousands of dollars by restoring instead of demolishing.